Introducing musical notation as the note family with characters to represent each note makes a tricky concept immediately accessible. 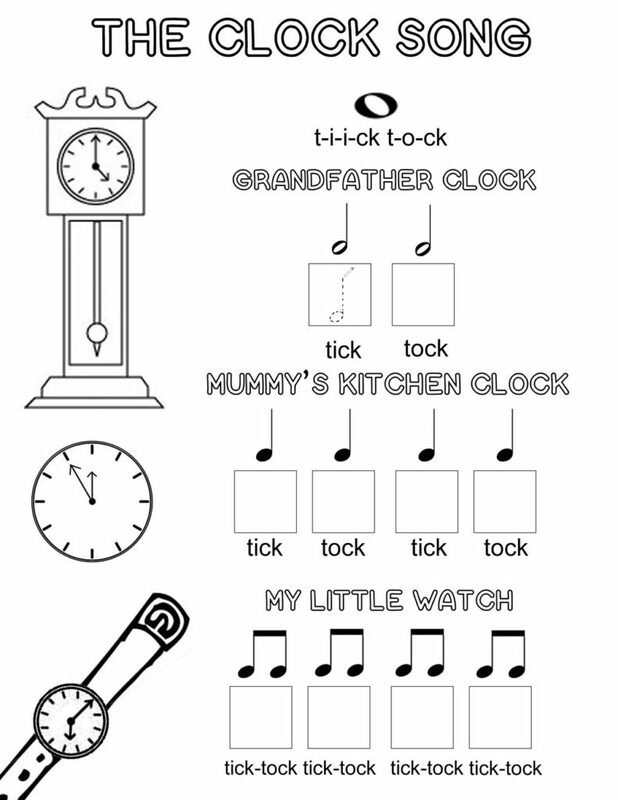 This way, children find the note names and their time values so much easier to remember. Make sure to explain that these are their nick-names to help us to tell which is which, and point out the proper part of the name too. First of all using the sheets below, clap or tap the sounds and lengths of the notes together. 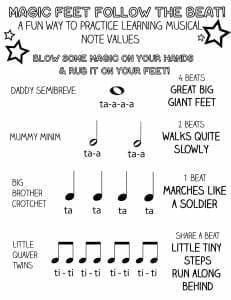 Then with Mummy Minims (2 beat notes), and then with Daddy Semibreves (4 beat notes). Younger children won’t be able to play quavers at first as this requires more control, so leave them for now. Play this in both hands. Using the work sheets have a quiz, where you can take it in turns to test each other, guessing which notes you are playing. Use wooden sticks or a drum to tap the rhythms, and you can have lots of fun marching around the room to Magic Feet Follow the Beat. Play these games often, to build a firm understanding, and easy familiarity with the names of the notes and their values. 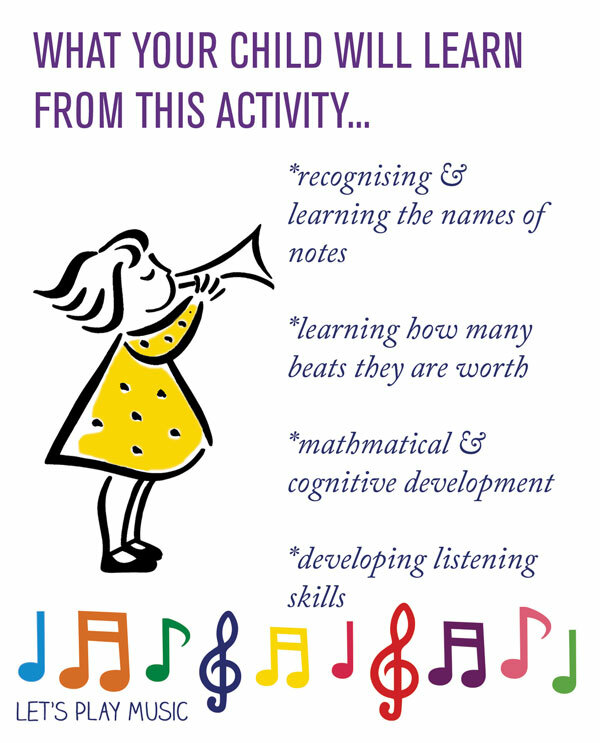 I have found this approach to introducing children to music note values highly effective over my years of teaching. As you will see from the posts across this site, I use this approach in a variety of different ways. But one of the most engaging ways is through storytelling. I’m delighted to say that I now have an eBook with a number of the most popular stories that I tell about The Note family and all their adventures in magical music land! You can check out more about the book below. This is so cool, I am definitely going to start teaching kids and this is the best I have seen. Excellent! Hello this is really helping me but I do not understand the family notes can you show them in the abc in the keyboard which one is which or explain better. 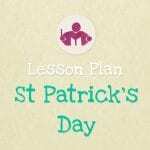 This lesson is brilliant!! 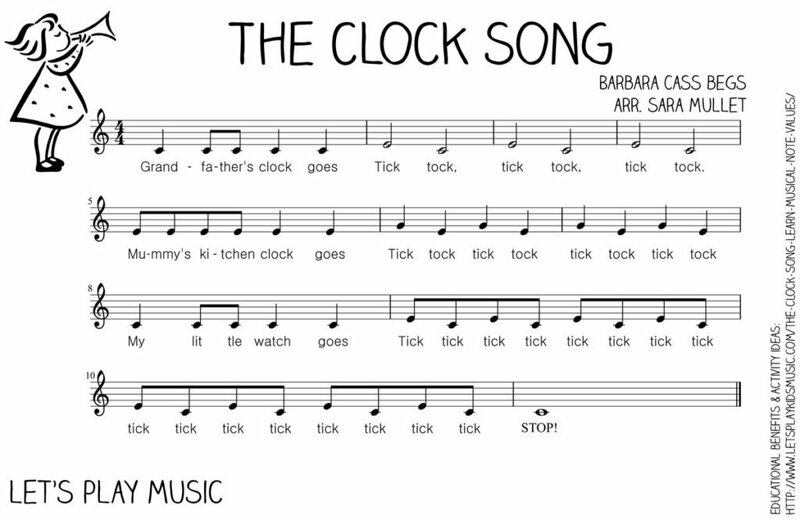 I don’t know if you know Spanish, but, is there any translation for the Clock Song?. It would be very useful for me to have one, as I have a 6-year-old student. Thank you! All your lessons are amazing! Thank you for having these posts! I’m about to start teaching and I had no idea where and how to start, but now I know! Thank you for writing! I absolutely LOVE your work, it is so helpful! I’ve played piano for years and a family asked me to teach their daughters… I had no idea where to start! I noticed that the links you clicked to download the documents don’t work, they take me to a random page. Is there anyway I could still get them? Thank you for your kind comments 🙂 Sorry you have had problems downloading the free resources, but we are currently updating the site, and the free resources will soon be available included in their relevant posts, rather than separately. This will take a couple of weeks to complete so do visit again soon.If you like Let’s Play Music on Facebook or Google+ we will announce when it is all done. I’m so sorry that I seem to have missed your comment – so glad that you’ve found the site helpful! We’ve just had a reshuffle of our free resources and i’ve been going through the process of changing all of the links – you should be able to download the music from the song post that you want to play or you can find a list of all of our free resources here: http://www.letsplaykidsmusic.com/free-resources.